27+2 Function Button Boxes designed with ETS2 and ATS in mind. The Aux/Mic in function will allow users to add their own switches or to use add-ons from BBJ SimRacing. 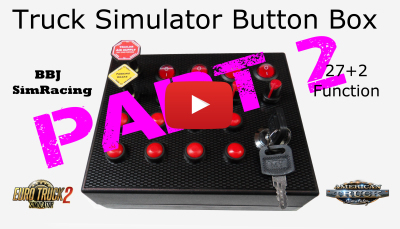 Button Box features 2x Push/Pull Switches for Parking Brake and Trailer Air Supply, 4x Circular Rocker Switches, 4x Rotary Encoders with integral Push to Make Switches, 8x stand alone Push to Make Switches and 1x Momentary Key Switch. This box is currently out of stock while it is undergoing a minor re-design. We intend to improve the quality of the push-pull switches and to change the case to bring the box in line with the rest of the 'pro' series. Watch this space for updates.